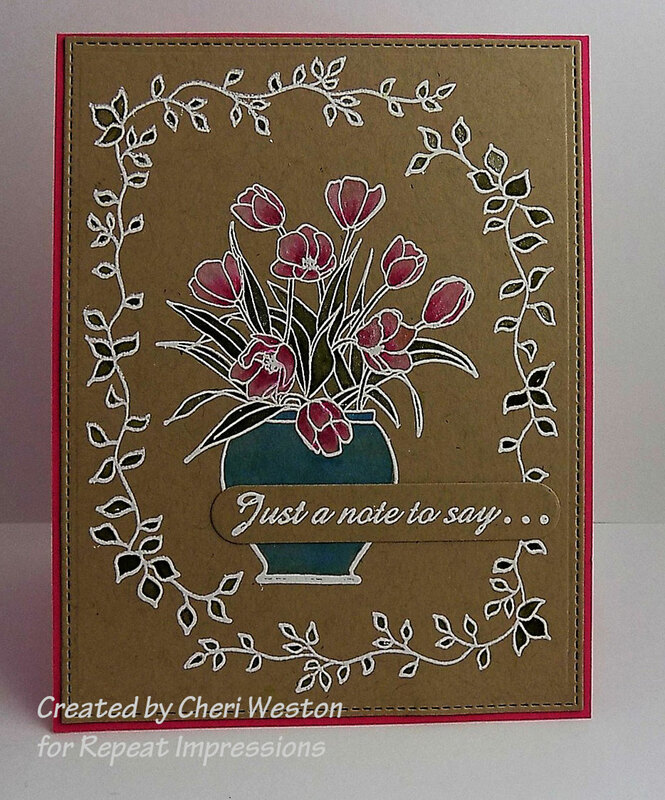 Hi there, Cheri here with a fun little technique you can try. 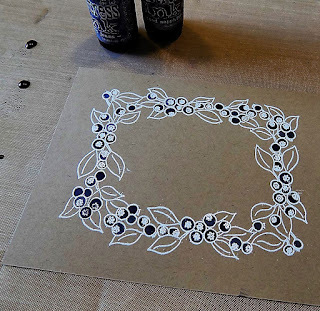 It's called painting with inks on kraft. 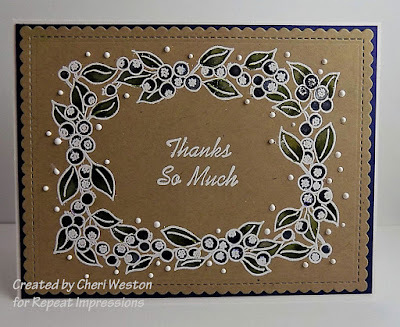 You'll need some kraft cardstock and open line stamps such as the ones I've used in my projects today. RI#1508-P "Vine Corner Border", #1001-P "Blueberry Border", #1317-L "Vase of Tulips", #2512-E "Just a Note" and 8607-D "Thanks". For one week only, these stamps are being offered at a 20% discount. So, grab them while you can at this fantastic discount. 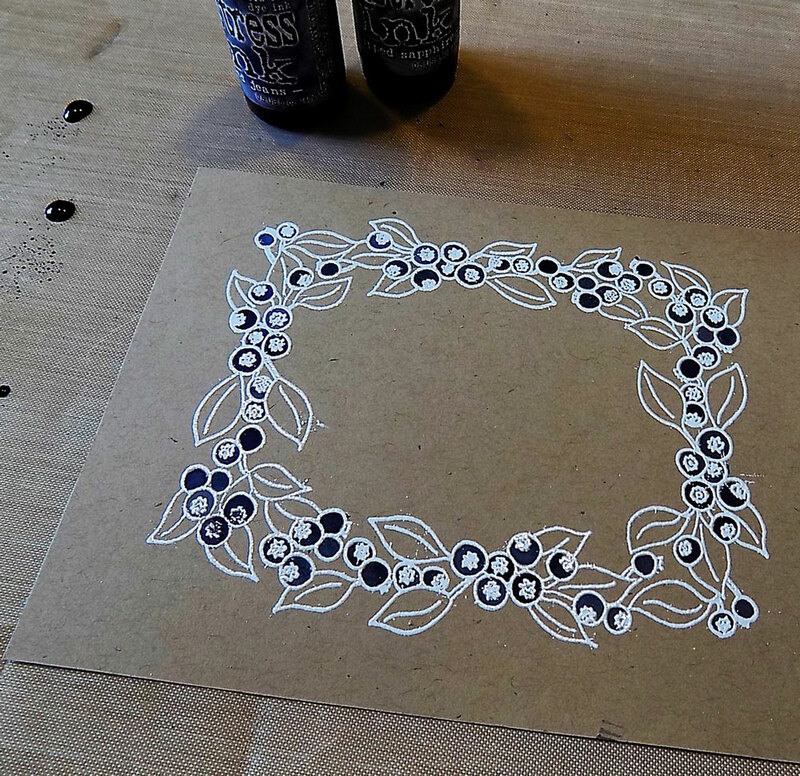 Here are the supplies you'll need to recreate this technique. 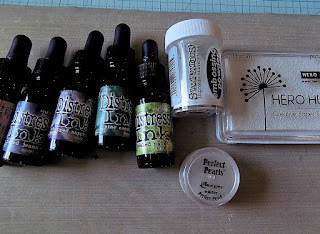 Distress Ink reinkers (you could use any inks even ink pads), white pigment ink, white embossing powder, and (if you'd like shimmer) Perfect Pearls. 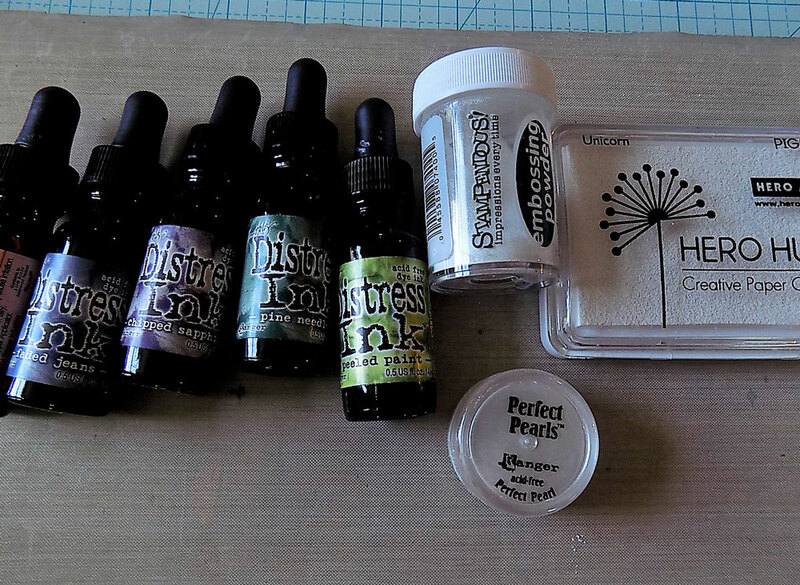 Not shown: Embossing buddy, MISTI stamp positioner and heat gun. To begin, cover kraft cs with embossing buddy or some other anti-static tool. 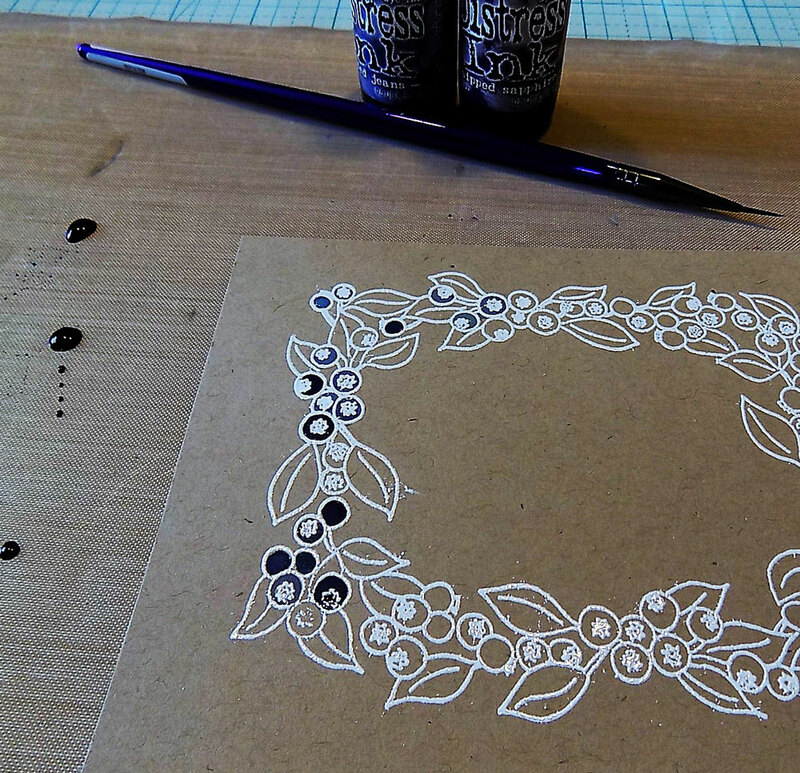 Then, stamp open lined stamp on kraft in white pigment ink making sure to get a good impression with the pigment ink. (that's when the MISTI comes in handy). 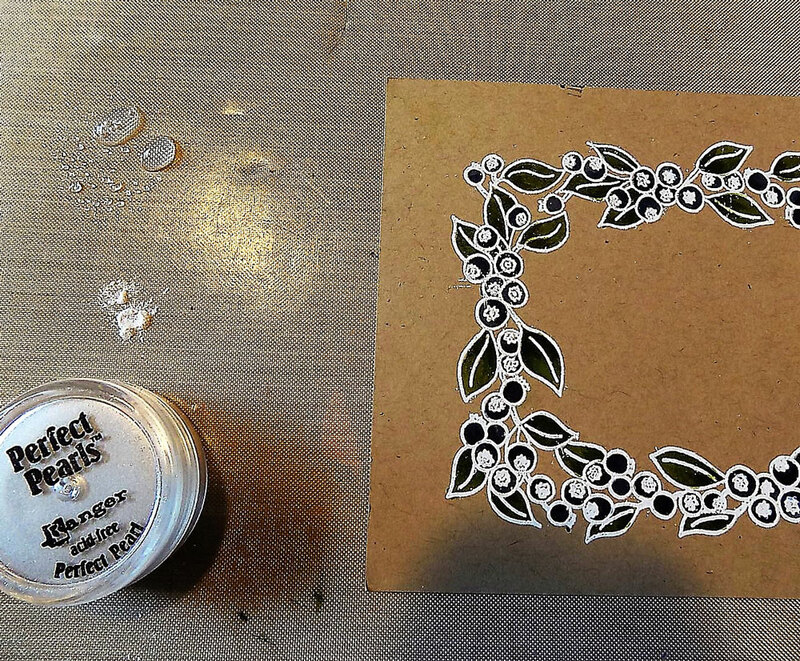 Then, sprinkle on white embossing powder over stamping and heat emboss. On a craft mat or some waxed paper or freezer paper, drop very small drops of the color reinkers you've chosen add a small spritz of water off to the side to help dilute the inks. With a small brush, pick up a little water and a little ink. 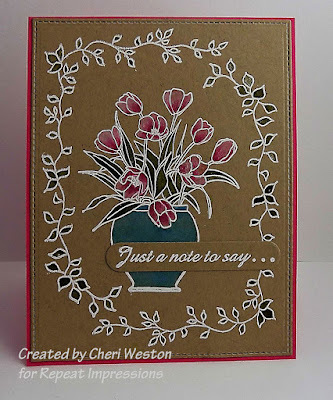 Have a piece of scrap of the kraft cs on hand to test the color and a paper towel to help absorb extra water or color. "Paint" inside the white embossed areas. When you're painting is complete, clean up your area of excess inks. Mix a small amount of water (spritz again), and a little scoop of Perfect Pearls and paint the area again with the shimmer if you like. I like the shimmer so I added it to my images. There you have it! Easy, isn't it? You can now finish your project as you like. I hope you found some inspiration here today and I encourage you to experiment with inks you have and see what you come up with. 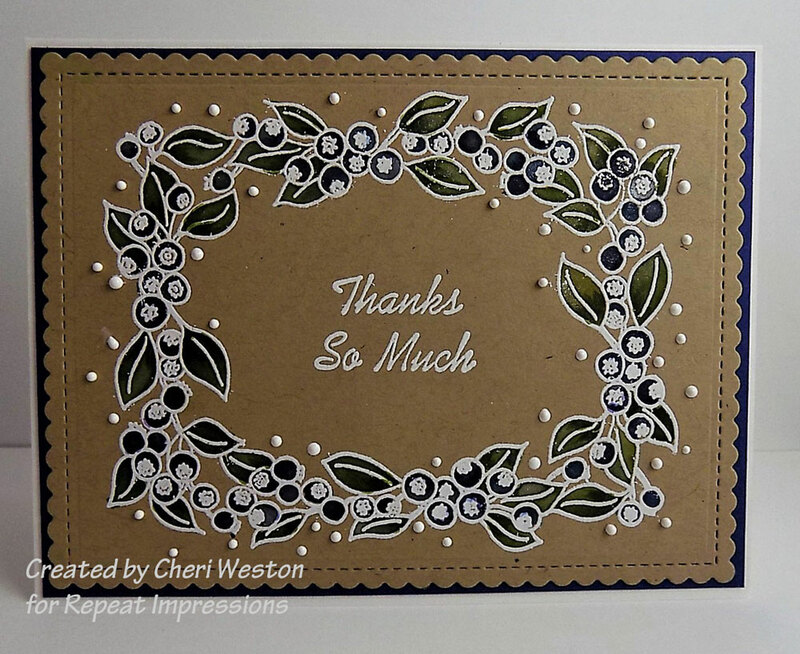 Thanks for stopping by and don't forget to grab the stamps I've used before the 20% discount runs out in one week. I love your first one- really reminds me of an Oriental Rug!